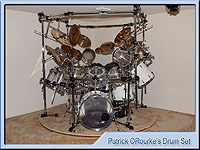 The Pearl Masters Acrylic Clear drum set. The Ludwig Classic Maple drum set. 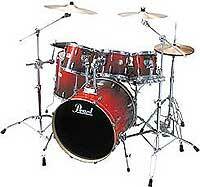 The Pearl Maple drum set is also tribute to great drummers and a gigging set for today's demanding rocker. Maple shell construction gives supreme resonance and awesome tone. 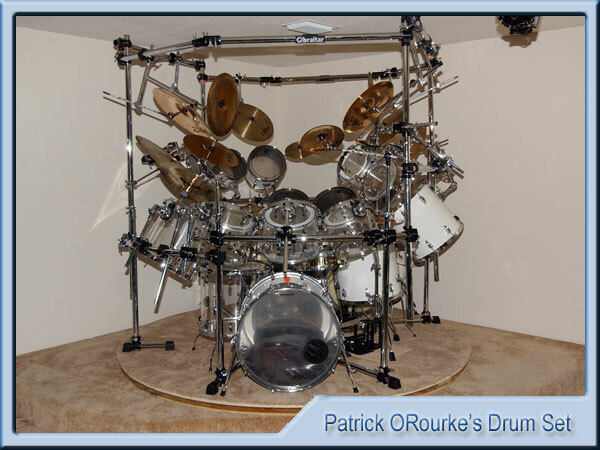 A huge bass drum and powerful toms deliver massive low end presence. The snare provides both cut and fat tones. 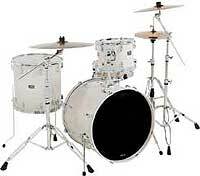 The Pearl drum set is also tribute to great jazz drummers and a small kit for small stages. Featuring birch-ply shells with 6-ply 7.5mm thick rack tom and 8-ply 10mm thick floor toms and bass drums. Inspired by Pearl's Masterworks and Reference Series, the thicker floor tom and bass drum shells deliver high energy power and punch while the thinner rack toms offer incredible sensitivity and tone to give Vision the widest dynamic range with unmatched musicality. Nothing short of Pearl's Reference Series is anywhere close to matching the Vision's sound. 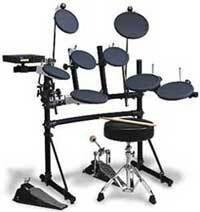 The Roland electronic drum set is excellent for quiet venues. Allowing the drummer to be fully expressive and not hold any fast drum fills back, the volume of the drum kit is maintained. Featuring Voices - 512, fully editable Drum Sets - 32 user programmable, Dual Zone Trigger Inputs - 9 stereo + 1 Hi-hat, Built In Sequencer, Hi-Hat Nuance CV - Full, Cymbal Choke Capabilities, User Adjustable Effects Processor - reverb, delay, chorus and flange.